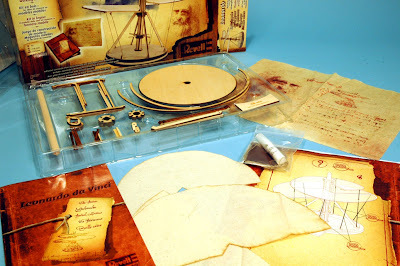 In the middle of 2010, Scale Model News carried a report on one of the new kits from Italeri, originated by Academy, that explore the technological design marvels from the pen of that Renaissance Man, Leonardo da Vinci. At the time it was said that this literally was a rebirth of interest as you would be getting models from not one, but three different kit companies. 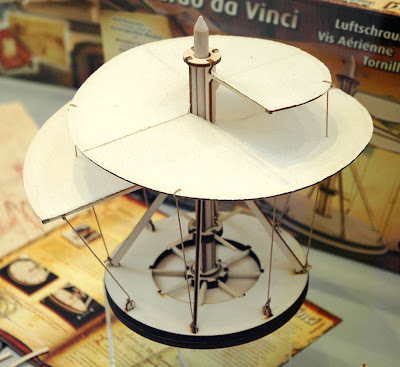 Two would use conventional plastic - as does the Academy/Italeri - but Revell planned kits that would use materials that Leonardo would certainly be familiar with - wood, cloth, and cord. Six of the ten da Vinci kits have been issued, and they are not only an intriguing cross-section of his designs and inventions, but certainly look the part in these traditional materials. They are also reasonably easy to build, as both wood and cloth parts are pre-cut and pre-stained. 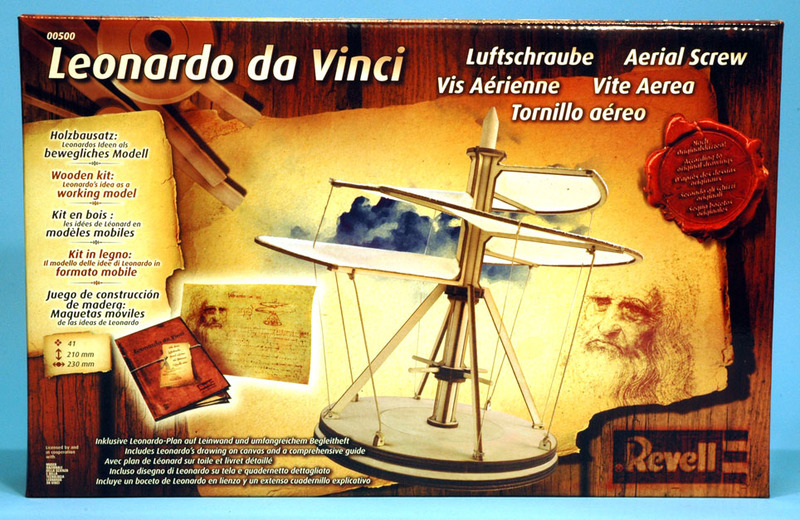 The first kit I’m looking at - the rest will follow - is one of Leonardo’s best known designs, the Aerial Screw, or as some would have it (although really incorrectly!) his ‘helicopter’. 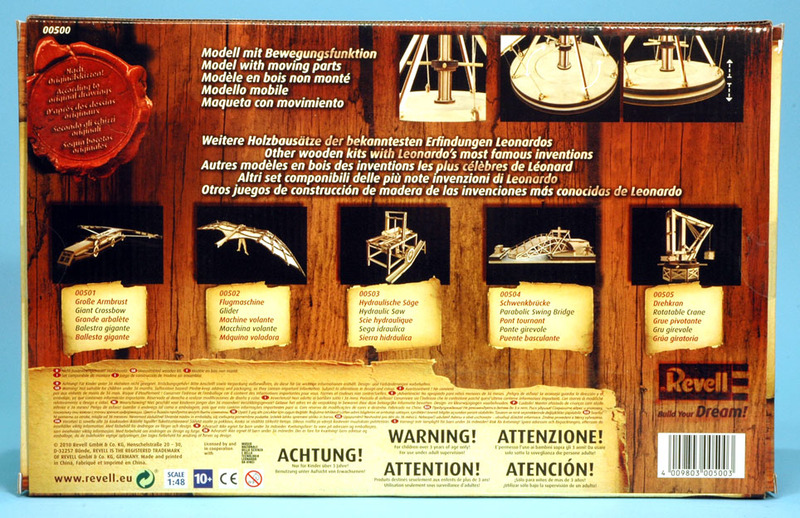 Revell provides great details for the build, with everything in five languages, headed (naturally enough) in Italian. 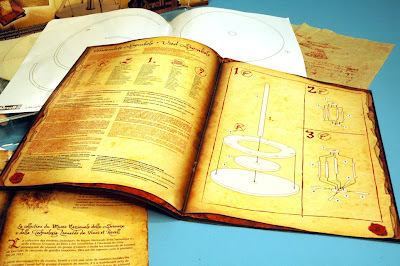 You get the layout of the pre-cut wood parts, and the cloth for the ‘sails’; full-colour (well, ‘sepia’ to be more precise) instructions, and a booklet on the thinking behind the design. The Aerial Screw would not have worked in reality, as it was far too heavy, but the principle was correct and is the way modern propellers function. 1-2 The Aerial Screw model is approximately 1:48 scale. The box has an attractive 'olde worlde' design. 3 The back of the box also shows the other five kits in the first batch. These include a glider and a swing bridge. 4 Pre-cut thin ply parts (back), packed in a tray to keep them in place; the cloth ‘sails’ (centre foreground), and the booklet, (left foreground). Each kit also has a cloth imprinted with Leonardo’s drawing, and his famous backwards writing (back right). 4 The instructions show that assembly is little different to a conventional plastic kit, except that you use the supplied wood glue to hold parts together, instead of polystyrene cement. 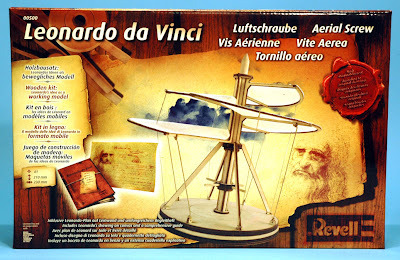 More about Leonardo da Vinci here. Thanks to Revell for the review kit.